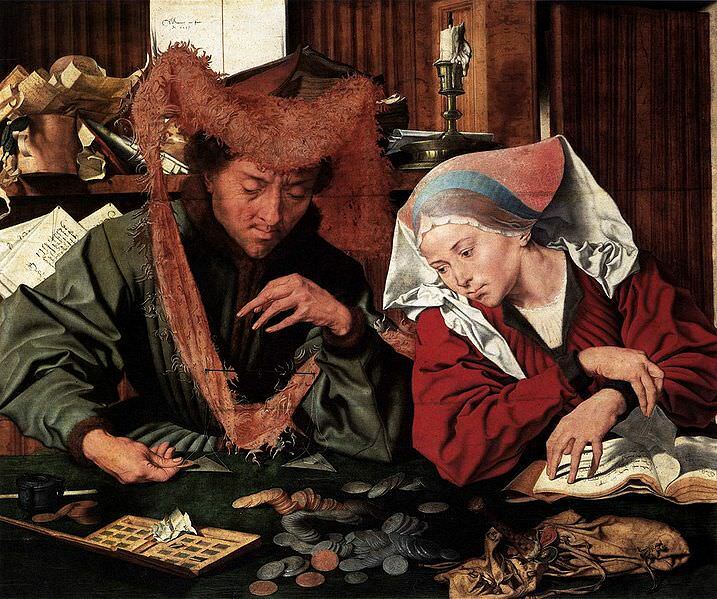 The Money Changer and his Wife (1490). Introduction: The difficulty of understanding the value of things in the Middle Ages is one of the obstacles to our understanding of economic life in that era. The issue is first of all associated with the ways medievalists quantify and use numbers. Value was first investigated when studying prices in the 19th century, as a prerequisite to any knowledge of the economy. This avenue, explored by major researchers like J. Thorold Rogers and d’Avenel in the 1880s-1890s, reached its apogee in the 1930s with the extensive investigation launched by Beveridge. It has been ignored over the last decades, while economic history was losing ground in the eyes of French medievalists. For some twenty years their researches and their reflections turned rather to qualitative data wherein the issue of non- mercantile exchange, of donation and its economy, has gained a more prominent position than the study of mercantile exchange, initially considered as research on prices and values, or the relations between things . This evolution is well known, if not always explained and understood thoroughly. It is supported by a number of methodological assumptions which make more complex the study of an economic history which specialists now wish to embed in a social context. I would like to stress that this viewpoint is short-sighted. The main focus since then has been the study of the relations between people through things. The aim is to include the understanding of the value or price ratios established between things into the latter. The study of prices in the long- or short-term, carried out by comparing the factors or the functions of supply and demand, should not be considered in any way incompatible with the study of social determinants interfering with pure market mechanisms. On the contrary, the former combine with the latter as part of their expression. This combination does, however, admittedly undermine the understanding of the processes at play in their formation. Not only the measurable, econometric data, but also describable and accessible but nonquantifiable facts should be integrated into the equation. Consequently, although measuring value is a challenge and its resolution may throw light on many aspects of economic life, It is not an exhaustive description and It is also necessary to explore the procedures involved when objects are exchanged, such as conversion systems, to better grasp the reality of exchanges. In the same spirit, I would like to present here a few reflections on the measurement of values, on prices and counterparts, mainly but not only, during the early Middle Ages.